Rep. Todd Stephens reads the names of four victims of domestic violence killed in Southeast Pennsylvania in the past year. 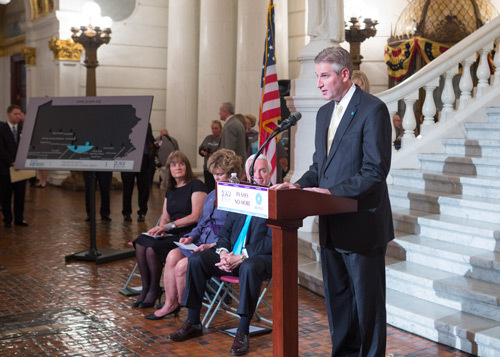 HARRISBURG-- Rep. Todd Stephens (R-Montgomery) joined colleagues in recognizing October as Domestic Violence Awareness Month by honoring victims of domestic violence who were killed during the past year. During a ceremony in the Capitol Rotunda, Stephens read the names of four individuals killed in acts of domestic violence, including one from Montgomery County: Deborah Harrison, Linda Rooney and Deborah Winkelvoss, and five-year old Cion Styles. Stephens joined Peg Dierkers, the executive director of the Pennsylvania Coalition Against Domestic Violence, who introduced the legislators who took part in the event. Domestic Violence Awareness Month evolved from the first Day of Unity observed in October 1981 by the National Coalition Against Domestic Violence. The goal was to connect battered women and advocates across the nation working to end violence against women and their children. The Day of Unity soon became a special week when a range of activities were conducted at local, state and national levels. The House recently passed House Resolution 1035 recognizing October 2014 as “Domestic Violence Awareness Month” in Pennsylvania.